Thanks Aunt Cathy for giving up sweets for Lent and giving me these Oreos! 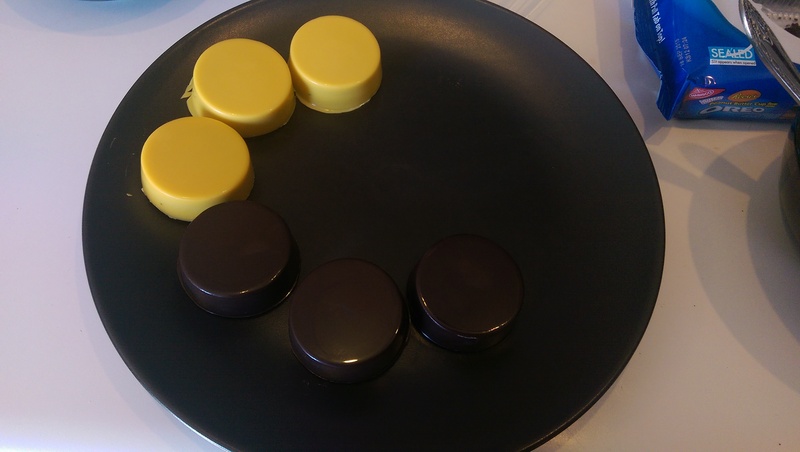 Start by separating your yellow and chocolate Candy Melts into two microwaveable bowls. Since Neo just skims these posts, now would be a good time to say I cracked a bowl in the microwave while heating these. Though I’m pretty sure it’s because the bowl was already chipped and old. Oops! Microwave the Candy Melts according to package instructions and stir with a spoon until smooth. I used iced tea spoons for all my mixing needs, they were the perfect size for this recipe. 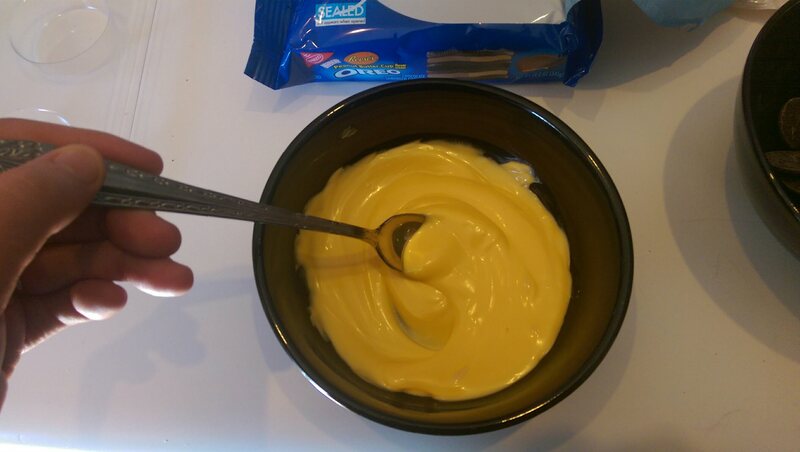 With your Oreos successfully in place, spoon about 1-2 spoonfuls of Candy Melts over top of the cookie. 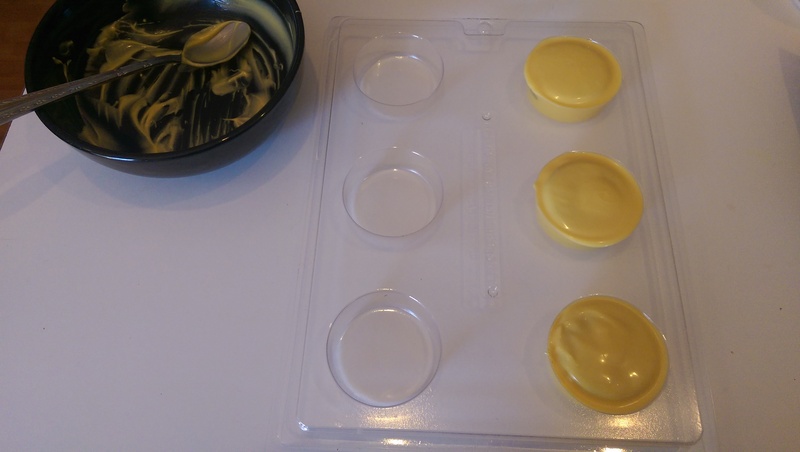 Spread and shake as needed to allow the Melts to flow into the sides of the molds. Yellow done. Estimated 1/3 bag of Melts used for these. No, they’re not actually over-full. Just weird lighting, I suppose. 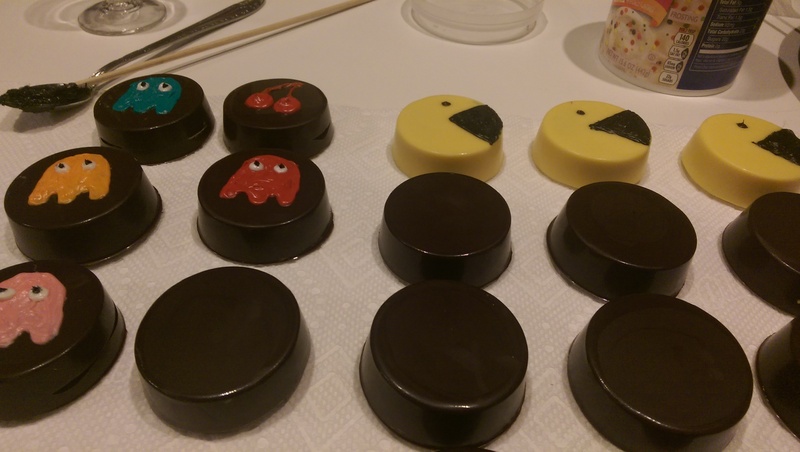 Rap the filled mold(s) sharply on your work surface to ensure even Candy Melts distribution and minimize air bubbles. Refrigerate for about 10-15 minutes or until cool and set. Unmold. 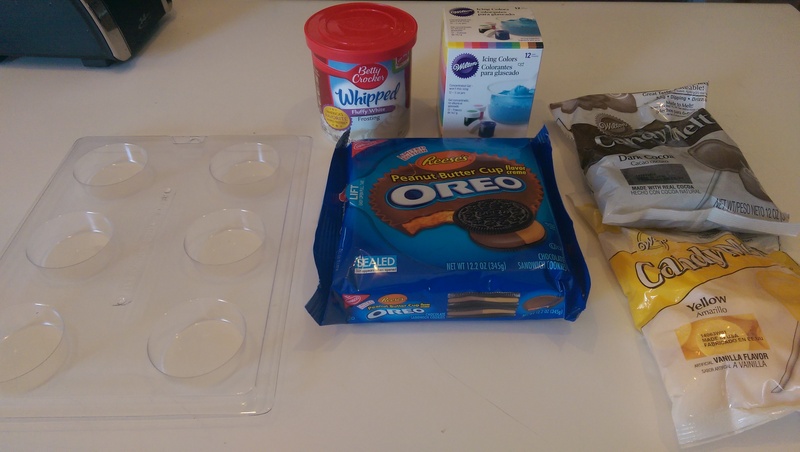 Arrange the Oreos smooth side up on your work surface. For ease in cleaning, I used paper towels as my work surface. It provided soft but sturdy support, prevented the cookies from moving, and stopped me from staining my white counter top. 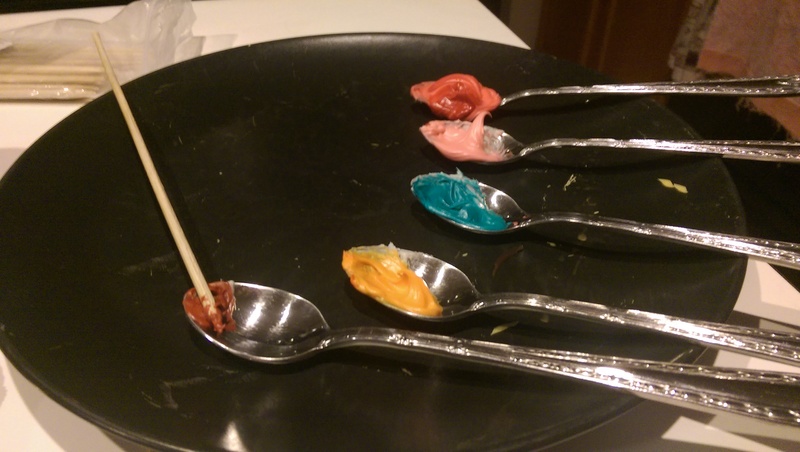 Take a small spoonful of room temperature white frosting and mix your colors. Seriously, a dab will do. 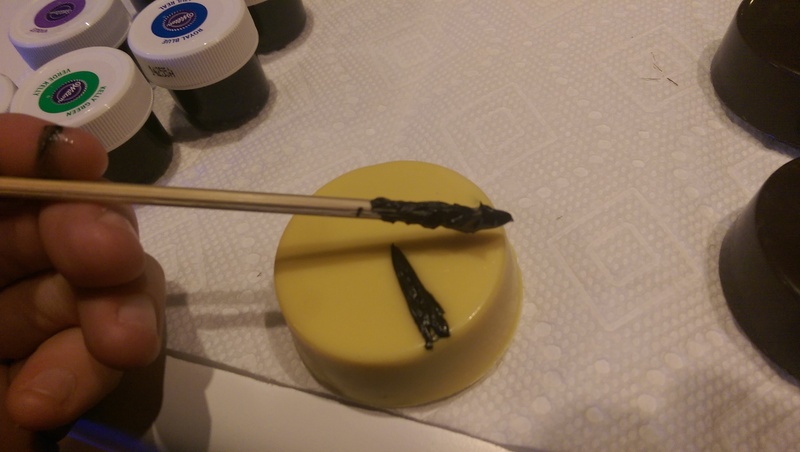 I found it best to apply the gel colors with a wooden skewer but you could also use a toothpick, chopstick, or lollipop stick. Get creative with the tools you have! 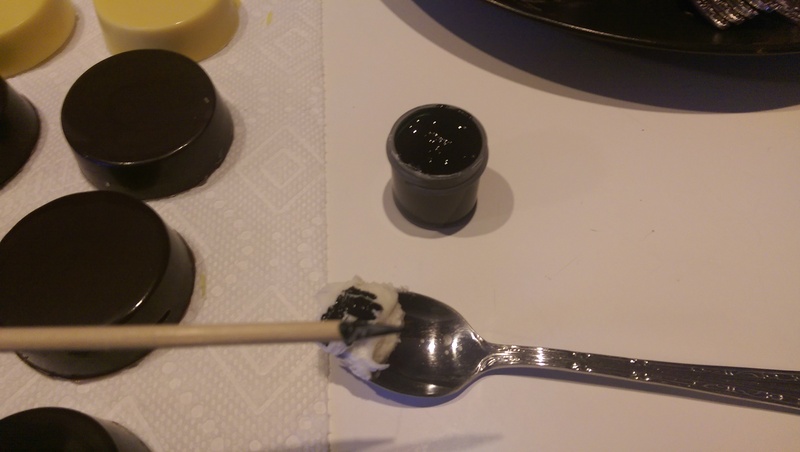 I do not recommend handling the Oreos while ‘painting’ as the chocolate can and will melt. 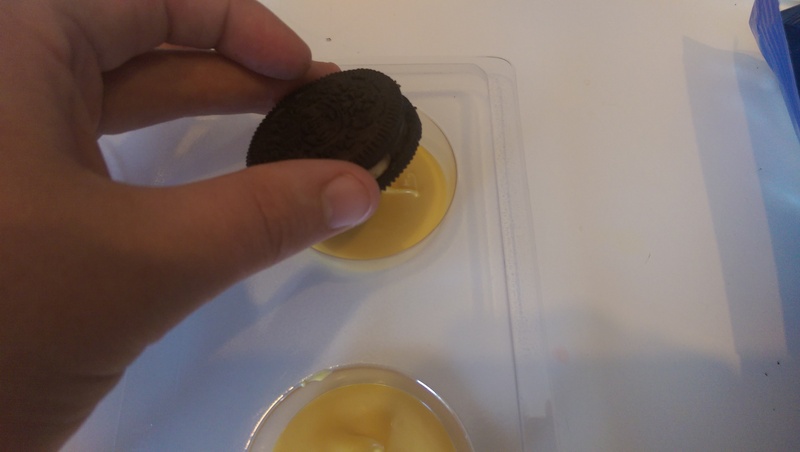 Use your fingers only to move the Oreos as needed. Yes, that’s really all I’m using. Do you understand how valuable these little pots of coloring are?? Preparedness. It’s a Girl Scout thing. Filling in with color, painting the eye. 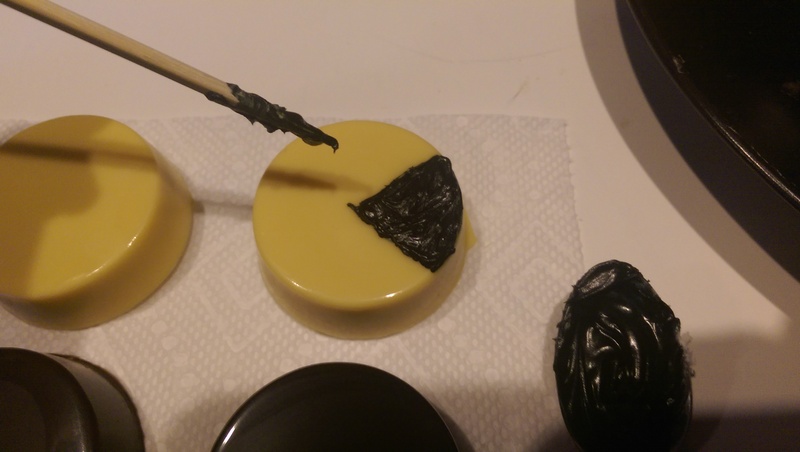 Pac-Man: Looks way better with black edging on your yellow coated Oreos. For the ghosts: Make an elongated half circle, extend the icing at the bottom sides and center for a rounded wavy edge. Wait for the primary ghost icing to set before applying white and black for the eyes. Yes, it’s actually easier to do it this way than to make the eyes first and fill in around them. Cherries: Use the tiniest bit of copper icing for the cherry stems. Copper will show up better than brown. Borders: Add the double line blue borders last, after you’ve decided on the configuration of your maze.I plotted out the position of Pac-Man, the ghosts, and cherry first. Cute. Tasty. Bite-sized. Fun. I can’t even. These made me exceptionally happy this week. Hopefully you enjoyed them, too. These can be refrigerated or stored in a dry, sealed container. Unfortunately, I couldn’t really tell you how long they’ll be good to eat as all of Neo’s coworkers have eaten them by this point. Yes, he was seriously disappointed that I didn’t use Original Oreos that he took these in to work so I can make another batch. 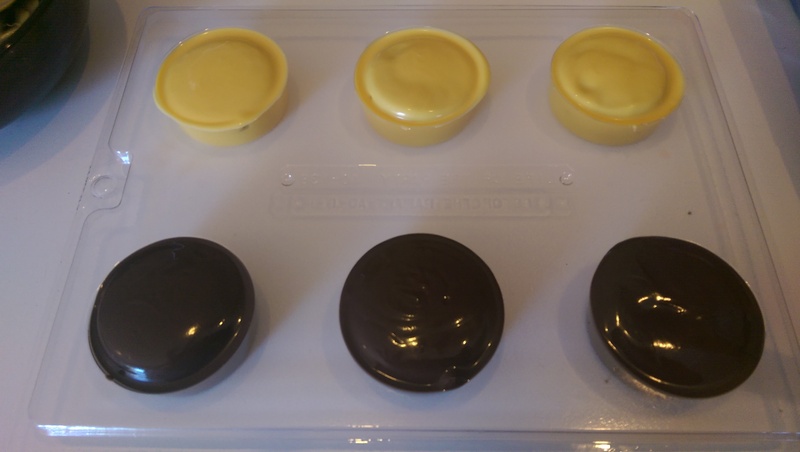 He also demanded a second batch of fruit-free Sonic Cheesecakes because he doesn’t like fruit with his dessert. This is my life. Oi. OH MY GOODNESS. THESE LOOK SO CUTE AND YUMMY! How long did it take you to make these? Thank you! They were super easy, too. 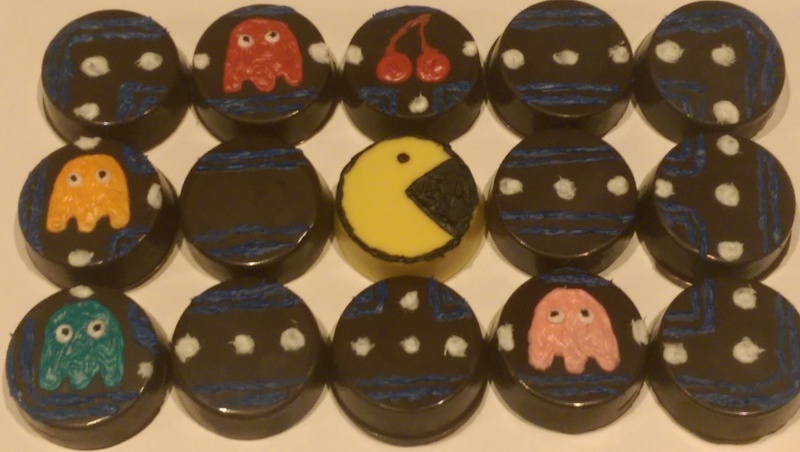 Each batch of 6 Oreos took about 15 minutes to set up in the fridge, plus ‘paint’ time. That took about an hour because I hadn’t really thought about the final layout, but with a bit of planning between batches you could probably cut ‘paint’ time in half, depending on batch size. Nice! 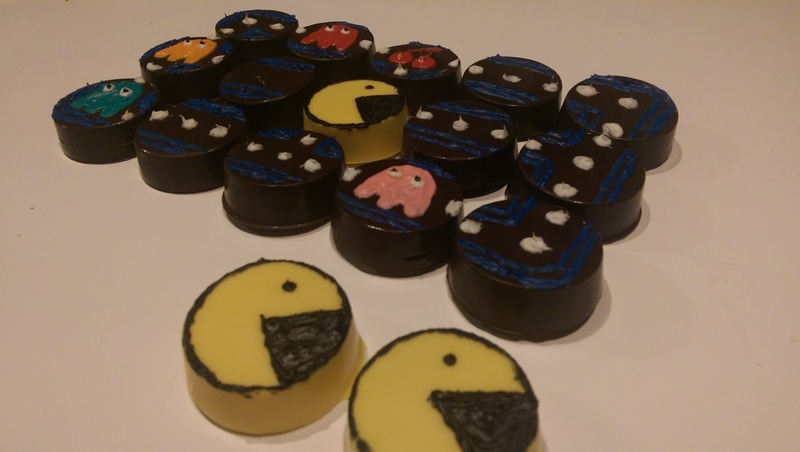 They look as interesting as the pacman game.